At first glance, there’s a lot about Charlala Hong Kong Cafe and Hair Studio that doesn’t seem to make sense. Let’s start with the name: It’s a restaurant and a barber shop? So, when they found a University District storefront with one entrance but two totally separate rooms — haircuts turn right after entering, diners turn left — they snagged it. Chim, 29, runs the restaurant, her husband is the hair stylist. 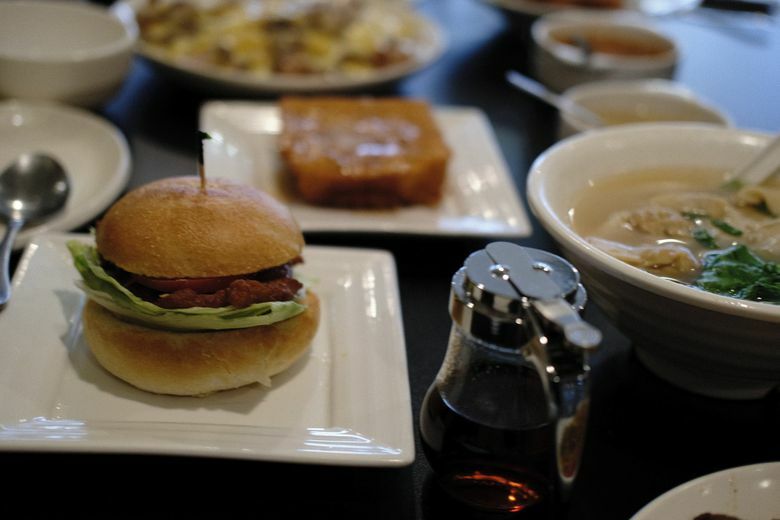 Her family emigrated from Hong Kong in 2000 and also owns A+ Hong Kong Kitchen in the Chinatown International District. Let’s move to the menu. Here, from one kitchen, is chow fun, borscht, French toast, baked spaghetti, wonton soup and pork-chop sandwiches. This is Soy Sauce Western cuisine, Chim explains, a distinct and decades-old brand of fusion resulting from Hong Kong’s 150-year history as a British colony and international trading hub. Charlala is a cha chaan teng, a tea restaurant, with a long, eclectic menu of mostly Western food splashed, sometimes literally, sometimes figuratively, with soy sauce. 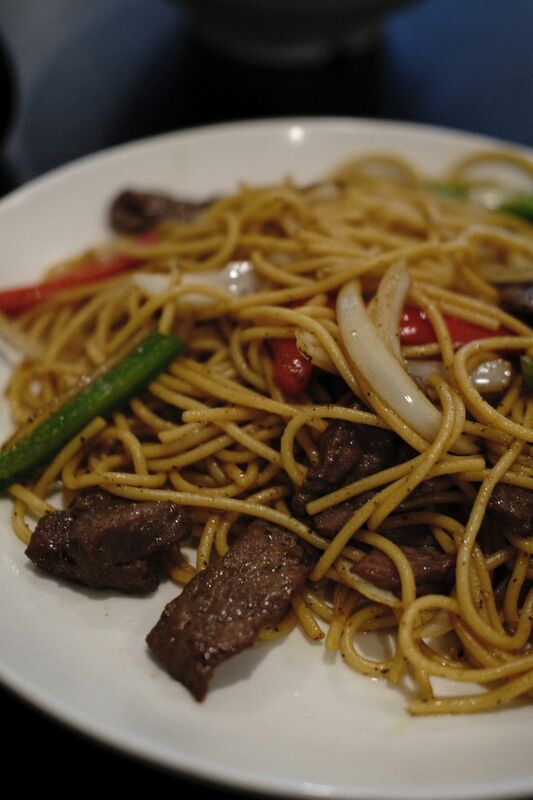 Literally: Black pepper beef fried spaghetti ($12) is tossed with steak, bell peppers and onions, tinged with soy sauce and just crushed with black pepper. It’s like lo mein, turbocharged. Figuratively: Just 40 miles west of Hong Kong, across the Pearl River estuary, is Macau, which was long a Portuguese colony. So here is baked Portuguese chicken, over rice or spaghetti ($10). A curry gravy blankets chunks of dark meat and onions atop a spaghetti casserole and the whole thing is baked and gratinéed with melted cheese. Is it Portuguese? Is it Chinese? Is it Midwestern? I don’t know. It’s very good. Every entree comes with a soup — either egg drop or borscht (beet-free), the latter the influence of Russian immigrants who arrived in Hong Kong, via Shanghai, after World War II. But maybe you want to upgrade? 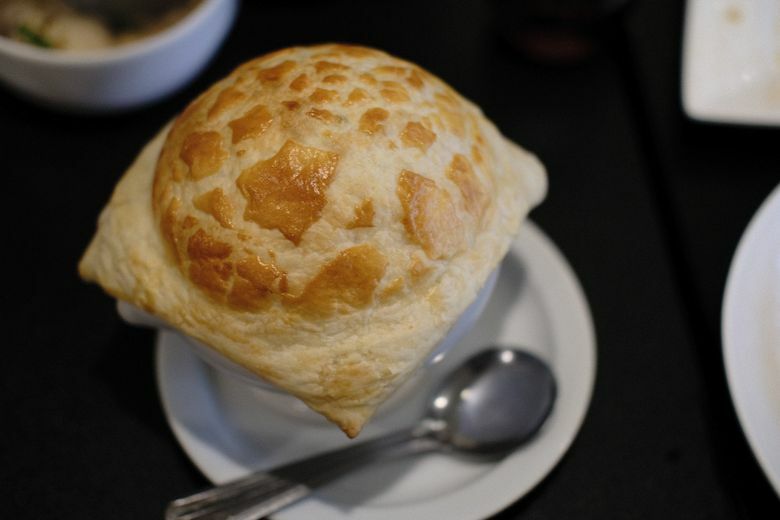 Try the baked seafood soup. You won’t find more pomp and elegance for $7 anywhere in Seattle. A pedestal-ed urn arrives, straight from the oven, crowned with a golden dome of puffed pastry. Crack through the orb and there’s a chowdery soup, studded with shrimp and mussels. Dunk the pastry in the broth. Escoffier would be proud. A pork-cutlet sandwich — pounded thin, breaded and fried, on a hard roll with lettuce, tomato and mayo — is right up there with the city’s best $5 meals. There’s a dessert menu heavy on sago, a tapioca-like starch, that comes, with various flavors, in sweetened coconut milk. The mango pudding ($4) is a standout, served in a plastic to-go container, quivering beneath a glaze of evaporated milk and chunks of fresh mango. But maybe circle back to the regular menu, where you’ll find HK Style French Toast ($5), a nearly two-inch-thick slab of white bread, stuffed with peanut butter, egg-battered and deep-fried. With a pad of butter melting into a pool of maple-flavored syrup, it’s golden and barely crisp on the outside, pale yellow and soft-as-can-be within. It’s everywhere in Hong Kong, Chim says. It’s glorious. Maybe next time I’ll get a haircut, too.